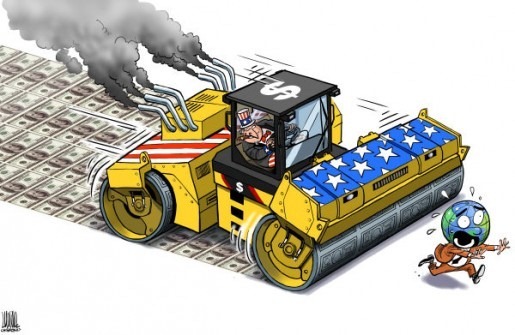 More on Abusing America’s ‘Exorbitant Privilege’: How Long can the US Borrow to Sustain Hegemony – up to a 100% Debt-to-GDP ratio? As part of a now lengthy chain (one, two, three, four) on US allies and the likelihood of US retrenchment (hat-tip to Andrew Sullivan for referencing this chain of posts yet again), I argued that American hegemony, despite America’s huge debt and deficit, is more financially stable than almost anyone expected. Because foreigners’ appetite for dollars seems unquenchable and because we print the global reserve currency, borrow in it, and face no serious reserve challengers (the euro and RMB maybe, see below), US can exploit this ‘exorbitant privilege’ far worse than anyone ever thought. For example, I think almost everyone expected the bond-market to turn against the US in the last decade given: exploding debt and deficits, huge welfare state expansions like Medicare part D and ObamaCare, the expensive and financially-unplanned GWoT, China’s relentless ascent, the Great Recession, and two rounds of quantitative easing. Wow – that’s a helluva list. Despite all that, interest rates and inflation are low, because we can exploit (and have) that exorbitant privilege. Stein’s Law says there must be a limit, but I think almost everyone is amazed at just how deep confidence in the dollar goes. More simply put, all this means is that foreigners so want dollars, that America can just print more and more dollars without consequent inflation, and borrow from foreigners a lot cheaply (because they want those dollars so badly). This means America can borrow and/or just print huge amounts of money at very low interest and inflation rates. That is ‘exorbitant,’ because no one else can do that without Greece-style financial trouble. We can borrow at low interest rates (the rate on the US ten-year bond is around 1.5% right now) and print lots of money (the recent quantitative easings, e.g.) without suffering like so many others who over-borrow and run the printing press. Barry Eichengreen’s book on this is helpful if you don’t quite get it. Vikash Yadav gave such good commentary on this tangle over at Duck of Minerva, that I have reposted our full debate on US borrowing and hegemony below. Warning: it gets fairly wonky, so please be sure to read the OP. Also, further IPE are comments wanted. Specifically, someone tell me please when the US will finally hit the ‘soaring’ inflation and interest rates regularly predicted by deficit hawks at the WSJ or CNBC? This is what Romney means when he says we will become Greece, but I just don’t see any evidence of that. Does anyone have a good guess on the timeline for exploiting the exorbitant privilege? When does it finally give way? When do foreigners turn against us in the bond market? As I said in the OP, I think it (super cheap US borrowing) has gone on already far longer than anyone expected. But I also think that a 100% debt-to-GDP ratio might be the bond-market turning point. That is a pretty big psychological benchmark. Vikash Yadav: “While I generally agree with your argument about America’s exorbitant privilege (and I can just see DeGaulle and D’Estaing spinning in their graves) there may be some other ways to read the data on international reserves. First, I believe the US dollar as a percent of international reserves kept by other countries has actually fallen from about 72% in 2000 to somewhere around 62% in 2011. It will tick back up a bit after this year, but certainly not back to what it was a decade ago. So there does seem to be a slow decline if we look at the composition of foreign exchange reserves. Of course, since there has been a dramatic increase in the amount of reserves being kept in the last decade, the US can borrow very easily. Second, the dramatic growth in the amount of reserves being accumulated, particularly in Asian emerging markets since the Asian financial crisis, most likely represents a form of insurance against reliance on the IMF in crisis situations. As such, this somewhat weakens the ability of the IMF to advance a stark ideological agenda (through conditional lending in the context of a crisis) which has largely been shaped and spread by American trained economists (in what James Boughton rightly described as the Silent Revolution) and the US government since the 1982 debt crisis. If global hegemony consists of more than just the ability to project military power, then American hegemony is not rolling along all that smoothly. It is also worth noting that a very large chunk of the reserve holdings is probably attributable to two Asian countries, Japan and China. My hunch (and I haven’t checked the numbers) is that around three quarters of world reserves can be attributed to about seven or eight Asian countries (particularly if we include sovereign wealth funds in the mix). So I think it is inaccurate to imply that foreigners in general have an unquenchable desire to hold dollars. I used to believe folks like Niall Ferguson or Barry Eichengreen on this: http://online.wsj.com/article/…. But these inaccurate predictions have been made since Nixon closed the gold window unilaterally – 40 years ago! This tells me that there is a lot of confidence in the dollar, or to be more specific, there is little confidence in other fiat currencies, which is all the dollar really needs. The euro-zone crisis particularly is a huge boost for the US. And I am pretty skeptical of the internationalization of the RMB. Exchange rate manipulation has been a pretty central element in the ‘Asian miracle’ formula since 50s. Japan has never really permitted proper internationalization of the yen even though people talked about that a lot in the 80s and 90s. And given how much poorer and poorly governed China is by comparison, I have large doubts that China will internationalize the RMB properly or soon. Maybe, but just consider the amount of corporate governance improvement (all the sunlight in dark corners of the banking system) required for China’s banks to really open up. That could get really ugly and even threaten CCP rule because of the sheer scale of corruption I am almost positive it would unveil. VY: “First, like you, I don’t think the current account situation will force retrenchment of alliance partners. What we are seeing instead is a continued hollowing out of the state over time but this may be unrelated to the dollar’s status as the premier international reserve currency (a status propped up not so much by faith in the US economy as rational attempts by emerging markets to shield their sovereignty from American economic imperialism) except to the extent that the dollar’s status facilitates easy credit to continue the trend. An economically neo-liberal state stakes its claim to sovereignty mainly on the provision of (domestic and cross-border) security and opportunities for unrestrained consumer consumption. The evidence of US decline will not be found in military sector or in the prison industry; decline is evident in the neglect of infrastructure, education, healthcare, etc. while inequality grows and democratic governance fades. The state will still be able to project power for decades to come but it will gradually erode the basis for internally regenerating that power and it will have to rely more and more upon poaching talent, financing, and resources from other countries. RK (me): “Our comments are becoming more dense than the post itself. I guess we are fairly close. I would add a few final points. 1. I am not sure how neoliberalism or the economic sovereignty of LDCs plays into this. 2. When it comes to hollowing out, I don’t actually see that so much. Borrowing allows the US to put off choosing between guns and butter, and that ‘putting off’ has lasted far, far longer than anyone ever thought possible. That is what is remarkable and what motivated the post. The last decade expanded, not hollowed out, the welfare state with Medicare Part D and ObamaCare. The real welfare question at home, IMO, is not raw levels of funding declining under the weight of defense spending, but distributional issues; i.e., transfers are increasingly upward, from poorer healthier workers, to wealthier, unhealthier retirees. 3. Obviously spending of any kind is fungible, so defense spending obviously leaves less for everything else. In that general sense, one could argue for hollowing out. But I think a better question is, if we can no longer borrow to have both guns and butter, what will be choose? One read of the GOP’s effort to delegitimize ObamaCare, SS, and Medicare is to pre-set the ground for this debate. If the GOP convinces Americans that the welfare state is for lazy slacker wimps, that makes it easier to ring-fence defense and so keep hegemony rolling along. 4. But I don’t honestly think Americans will choose guns over butter. No matter what the GOP says, SS, Medicare, and Medicaid are part of the US social contract now. They’ve been around a long time, and people have come to expect them; they feel they are ‘rights,’ not ‘programs.’ Norquist may think ‘starving the beast’ will work, but so far it hasn’t, because the government borrows, not cuts, when taxes short-fall. The GOP is fundamentally out of step with American expectations of government assistance, but it has (very destructively) convinced the median voter that he shouldn’t have to pay for such assistance (hence we borrow). So when Perry and others call SS/M/M ‘ponzi schemes,’ people worry, just like W’s second-term effort to privatize SS failed miserably. In fact, I think if Americans were really forced to choose between more aircraft carriers and checks for grandma, they would choose the latter. This is one reason I find the DC foreign policy consensus for hegemony so toxic and support retrenchment. I don’t think most Americans want ‘empire;’ they want welfare and safety nets (in part because exceptionalist, ‘foreign-aid-is-for-third-world-socialists’ Americans generally couldn’t care less about foreigners. It’s DC elites who get teary-eyed comparing the US to Pericles Funeral Oration and say we must be the ‘weary titan’ who sacrifices at home for a ‘national greatness’ cause abroad. 5. On RMB internationalization, I am far more skeptical than you. Agreed, the US banking sector is a mess, but comparable to China, really? The difference is still vast to my mind – can foreigners even list on Chinese stock markets? I wonder how many people would really be prepared to hold serious savings and value in a currency from a still technically communist state whose banking and corporate governance ‘rules’ are shot through with famialism, corruption, and informal political manipulation. These problems still plague the won and the yen, and Japan and SK are decades ahead of China in terms of openness and development. Is China really ready for serious, long-term foreign ownership of major assets and to allow the market to set the RMB’s value without tinkering? I doubt it; no one else in Asia does that and never has. I still think currency manipulation and other gimmicky nationalist barriers are central to the Asian growth model. Here is a nice example of just how bad this can be, even in supposedly-open Korea. This entry was posted in Economics, Foreign Policy, United States by Robert E Kelly. Bookmark the permalink. Interesting discussion. I didn’t read everything above, but I think one of the main factors why the vaunted “bond vigilantes” have not surfaced is the need for liquidity in the international finance system. That is, if one looks at the spread between US TIPS bonds (bonds that pay for inflation) and regular US treasury bonds- investors are willing to pay a premium (in lost inflation) to purchase treasury bonds. This is because most investors in this volatile environment prefer safety over return. The flight to safety has thus far saved the United States and will continue to in the future. Answering your question, I don’t think (because of the factors above) there is a causal relationship between hitting a certain debt-to-GDP ratio and a revolt in bond markets; if the politics of last summer is any indication, the bond market will continue to buy up until the dysfunctional US political system shows itself unworthy of this trust- then all at once- the game will be over. It will not be a function of a breached threshold, it will be a function of investors figuring out that the politicos have no real plan to manage the debt levels.